Designed for Mounting Square & Rectangle Signs in 12x24, 18x24, and 24x24 Sizes or Other 24" Tall Signage. Brackets Can Also Be Used for 18" Diamond Signs. 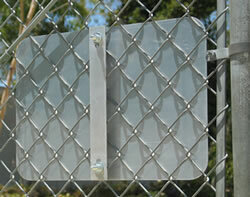 This bracket is only for used mounting 18x24 and 12x24 size Rectangle Signs. Also 18" Diamond Signs to chain-link fences and some styles of meshed security gates.